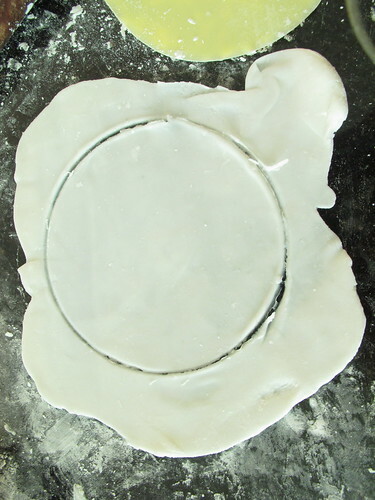 I was using the bowl given by Jom masak, Jom makan-makan (Thanks Cikmanggis) to cut out the round disc skin. There is pro and con if compare to two recipes. I have hard time to roll the skin because the dough was sticky and wet when i first tried Joceline's recipe, but amazing when i dust a lot of tapioca flour , the skin texture still maintained soft after steamed. Jane's recipe is easy to be handled, but the skin is easily to break (i guess due to high amount of Tang Mein flour) especially for those thin skin and also partly due to i tried to fill as much of filling possible, hehehe..
1. Heat oil in a wok, sauté dried shrimps till aroma. 2. Add in jicama, carrot and fried firm tofu, continue to cook for 15mins or till dry. 3. Add in seasonings and chopped coriander, mix well. Set aside to cool. 1. 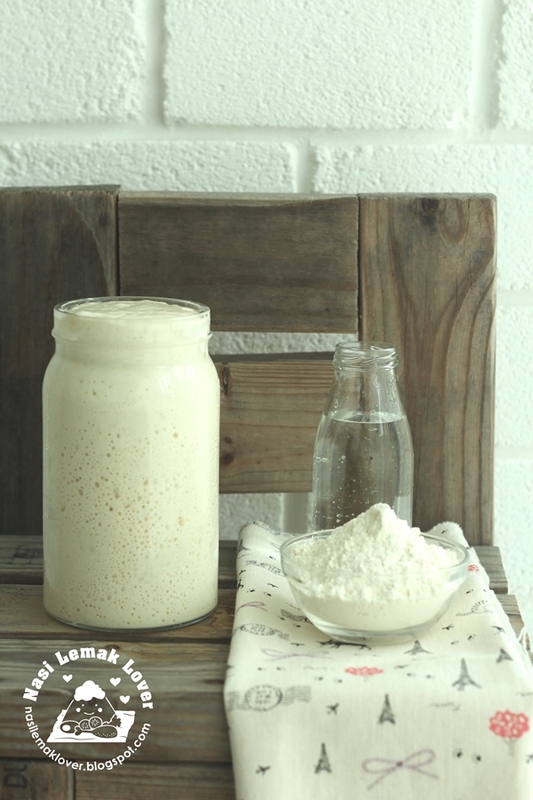 Mix two flours and salt in a mixing bowl, stir to combine. 2. Add hot boiling water into mixing bowl, stir and combine, add in cooking oil, mix well. 3. Cover the mixing bowl and set aside for 5mins (to cook the flour). 2. Wrap 1 tbsp of filling with each skin. 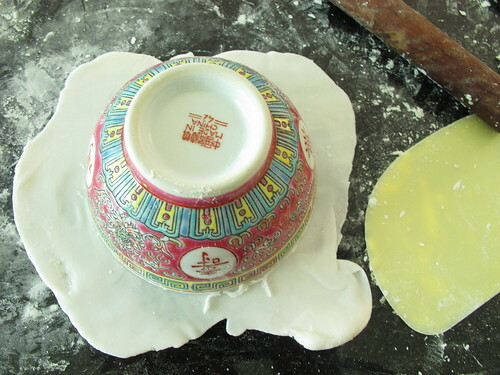 Wrap the dumpling skin like making pau and seal the opening by pressing the edges together. 3. Brush some cooking oil on the steaming plate, steam for 10mins. 4. 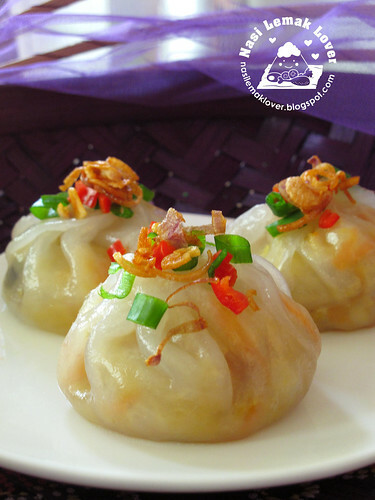 Remove the steamed dumplings and garnish with fried shallots, spring onion and chopped red chili. Serve hot. I was enjoyed with the chili dipping sauce given by Eileen the other day, the chili sauce is very yummy. Thanks Eileen! Oooh I love to eat this, especially with chilli sauce or sambal! Looks delicious! wow sonia, u also on chai kuih heat ya, hahaha! 2 pcs please, chili source can be omitted, coz i still have mine, hehehe! Now chai kuih is very popular amongst the blogger friends. I think Chinese do like this type of 粿。I like this shape too. I sometimes add a little bit more oil to make the dough easier to work with. I see so many cai kueh around lately until my hands itchy but actuly over here we don't call it cai kueh , urs the shape look like Xiao long boa . I love the bamboo basket it's so pretty. Btw my latest post is for u, take a look. Oh, I love this too! I eat this faster than if I make this..... Lovely and beautiful picture shots! wow!! i very like this kuih!!!!yummy!! Oooo...Sonia sedap tu...! kak ros memang tak boleh tengok dumpling la.....terguda sungguh.. nice!!! n thx to share the way to make a round skin~~ clever~~~!!! Sonia , that kuehs are too pretty to eat ! 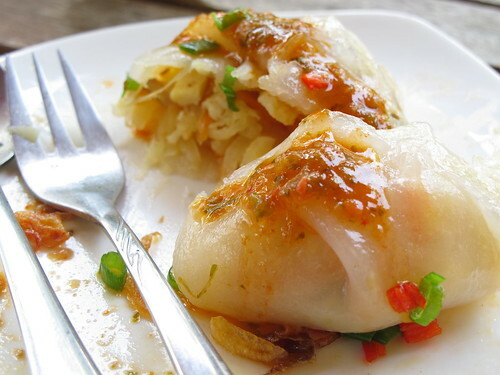 This is one of my fave dumplings ! 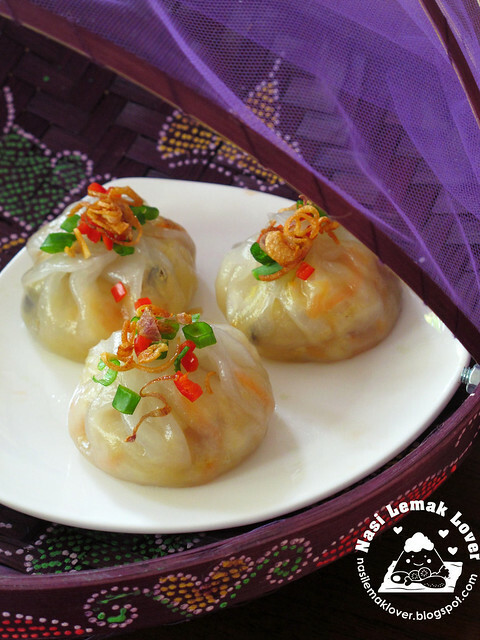 hehe saya hampir lupa tentang mangkuk tu:)I'll try this recipe.Nampak menarik sekali. Haha, sometimes cannot be too greedy la, take it easy, but nice also la, more ingredients will look like bags of money! Wow..., nice kuih £ nyonya baskets too! U know what I just bought teng flour so I can do this kuih kuih which I have not yet tried b4! I love eating them!!! Oh yummy! I love this and want to eat it from the screen! My family from old (公公婆婆) to young(小瓜) love to eat chai kueh. I love chai kueh! Love how you wrapped it which can be eaten in one mouth. I usually made mine in a curry puff (semi circle) shape...just makes me hungry thinking of it! These chai kueh are so gorgeous! Yummy Cai Kueh will have to try to make it. Thanks - I also wanted to try the chilli sauce that Eileen's made but can't read Chinese can you translate. Would like to try making this. Which recipe do you prefer? This or the previous one you featured? Thanks. Hi Sonia! Wow I'm very impressed that you make dumplings from scratch and you made it so easy!! 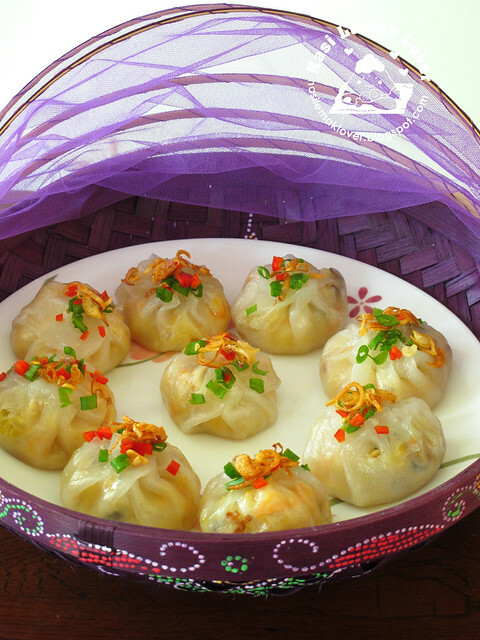 Beautiful and delicious dumplings with colorful toppings! i know it's very challenging making the skin..that's why i always put aside to make them but i really love eating these dumplings! 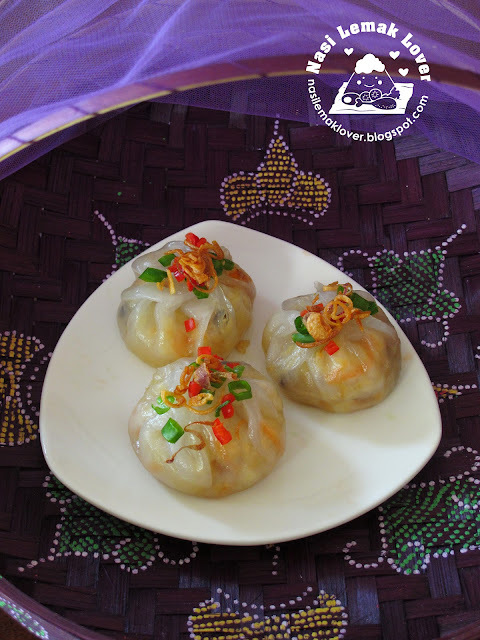 very beautiful dumplings just like all your previous ones! OMG ... I love chai kuih and it looks so so yummy. so overall which dumplng skin recipe would you recommend? I wanted to try making the other chai kueh recipe but now you posted another, I'm wondering which one to go for! Is this more like har gow skin? Hi, like Shu Han, i also wonder which recipe is better? Are both good as well? would the skin dough stick on your hand? do we need to wet our hands or put some flour to prevent to sticking? I love this steam chai kuih, yours look v v pretty n yummy! Thks for your excellent recipes, its my family favourite chai kueh. How do keep unsteam kueh fresh in fridge for future use? Thanks for posting this recipe. I used the skin portion of this recipe but for the filling I used from another recipe. I am more used to the filling of dried shrimp for the steamed dumpling. But this snack sure filled our craving for childhood memory snack. I'm going to put a link on my blog to this recipe.